Thanks for all your input on the ideas for giant art! I'm happy to say that an artistic friend has offered to guide me through the painting of those four thin dandelions -- so cross your fingers, hold your horses, we might have our own version of that beauty one day soon. 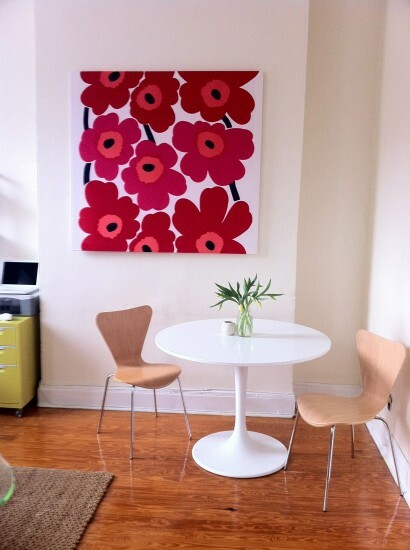 Stretched Marimekko Fabric by City Refugee. One of my favourite prints of all time, I'm thinking that this could be even more affordable and personal if I stenciled my own version of the famous UNIKKO print. Large shapes, simple colours -- me and my freezer paper can handle that. This ELLE Decor set-up, via Room Interior Design, has a much softer feel in warmer colours, and shows that a medium-sized print will work nicely, too. Stretched Stems via Real Simple. 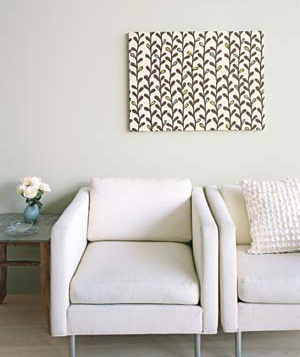 The grey seems like a perfect balance of neutral and interesting. Button Art by Little Green Notebook. I'm picturing it on a white background, for a slightly fresher look, but the loosely-matched colours of the rows of buttons are perfect just as they are. 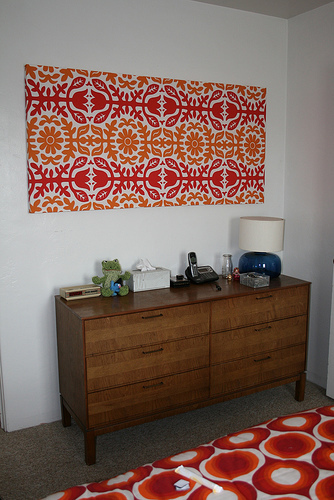 Stretched IKEA Fabric by Jenn and Romy. Recognise this fabric? I snagged three yards of it on clearance a year or so ago, sewed up a table runner, and declared it to be my favourite fabric ever. Admittedly, it might be a little busy for the wall, but as we have a yard still lying around, it might be worth a try. Have you had any success with fabric stretching? And prints or patterns that you think are totally art-worthy? Or have you ever tried to rip-off an expensive designer print with freezer paper? Oh hard choice! I am sure whatever you go for it would be fab! I know, so many lovely things. But the nice thing about stretched fabric is that it can easily be swapped out for different fabric, and sewn up into something else!